I mentioned that last weekend marked six months that Kristen and I have been together … one of the things I did was to finally finish the lovesong mix that I’ve been working on for a and have felt particularly resistant to doing with her, exactly because of the ways that it is romantic and sometimes intense, but it made sense; we finally gathered enough songs to while. Mixes are one of those courtship things that I have often done too quickly in the past, make a whole CD, and it felt good to compile. Just to further illustrate my reluctance to make a lovesong mix, the first draft of this CD was called “If Love Was a War, This Is How You Win,” a reference to the Feist song I chose, the lyric is “now I know I’m gonna win the war.” Kristen saw this title over my shoulder and was like, no. You can’t call it that. The second draft was called “Happy Through Rain or Whatever,” another lyrical refernece, this time to the Alice Smith song, and that too she wasn’t thrilled about. 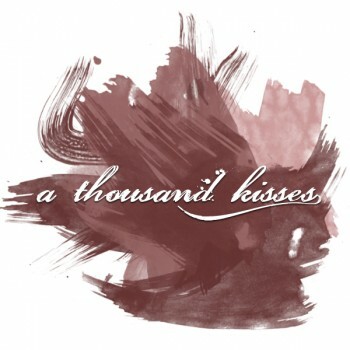 A Thousand Kisses, yes, romantic, but also a reference to the Mil Besos song by Patty Griffin. Also: funny thing about the cover. I spent a few hours working on the image, searching for photos of famous kisses, finally using the Rodin sculpture. I printed everything up and got the CD and cover and insert all together … and was practically gagging with the sweet gross romanticness of it. So I rebuilt the cover. Ahh, so much better. Still a bit romantic, but no longer over the top. Whew. you can use sites like imeem or songza to create playlists and share them without the order getting mixed up.. the downside is that it's trickier to find all the tracks you might want..
For some reason I had never appreciated “She’s Got to be” as a butch/femme song…I kind of tended to skip over it in all the other amazing songs on that album. Thanks for posting the mix and making me love Amy Ray EVEN.MORE. oh, it's lovely. for some reason "just say yeah" is just perfect right now; i've found myself just wanting to listen to it on repeat all day. Next post 100 Top Hot Butches 2009: on Monday!